Come in, Brigit, you are a hundred times welcome! 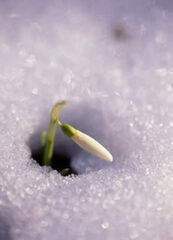 Imbolc or Candlemas is celebrated on February 2 and is the Festival of the renewed life on earth after winter. The earth awakens, the sun gains strength, lambs are born and the ewes are with milk. Another name for Imbolc is Oimelc (pronounced EE-mell) which is Gaelic for ewes lactating. Though Spring doesn't officially start until the Equinox of Ostara, Imbolc marks the first day of spring in the farmer's year. Snowdrops spring up in the places where the Goddess Brigit has been. Because winter doesn’t always end at Imbolc the custom of Ground Hog Day was created as a form of divination. At dawn on Imbolc a groundhog is released. If the Ground Hog doesn’t see its’ shadow winter will end. If the Ground Hog does see its’ shadow it is believed that winter will last six more weeks - until Ostara, the next Sabbat. If you don’t have a groundhog handy (and many of us don’t) you may use a hamster, guinea pig or even your cat or dog. At Imbolc it's traditional to light lots of candles to encourage the sun to shine brighter and for the Earth to awaken to the warmth of spring. Many Covens make their supply of candles for the coming year on or around Candlemas and hold special rites to purify and bless them. The Goddess of Imbolc is Brigit who is the Celtic Triple Goddess of Poetry, Healing and Crafts. She is the keeper of the sacred flame, the guardian of home and hearth. To honour her, purify and clean your home, your sacred space and your Tools of the Craft. Dress corn or straw dolls as brides and put in a Bride's Bed or basket along with a priapic wand and some nuts to ensure fertility and healing in the coming year. If you leave an article of clothing outside on Imbolc night, it may be blessed by Brigit and have powers of healing and protection. Smoor your fire on Imbolc eve and rake the ashes smooth, in the morning look for a mark in the ashes, a sign that Brigit has blessed your hearth. Green for the life growing beneath the snow. Imbolc Incense - Basil, Myrrh, Frankincense, Wisteria, Jasmine, Camphor, Cinnamon, and Lotus.